Gooseberry(Amla) is considered very effective to treat premature graying of hair. Boil some dried gooseberry(amla) pieces in coconut oil till it turns black. Apply this oil to prevent hair greying. Application of amla (gooseberry) paste is also very beneficial in getting rid of premature graying of hair. Regular massage of Gooseberry(Amla) paste rubbed into the scalp helps a lot to cure the problem of premature graying of hair. Massage your scalp and hair with butter made from cow milk twice a week. This simple home remedy has been shown excellent results for reversing the process of graying of hair. Boil some curry leaves in coconut oil and apply in scalp and hair roots. Massage for 3-5 minutes and leave the mixture for 15-20 minutes. Grate some fresh ginger. Mix with honey and place it in a jar. Eat 1 teaspoon everyday.This is also considered very helpful for treatment of grey. To cure the problem of premature graying of hair, mix 1 tablespoon of table salt to a cup of strong black tea without milk. Massage this mixture on the scalp. Wash your hair after an hour. A mixture of yogurt and yeast also considered very effective to cure the problem of graying of hair. Take a bowl of yogurt and mix 1 tablespoon of yeast. Have this mixture before every meal to reverse the process of graying hair. 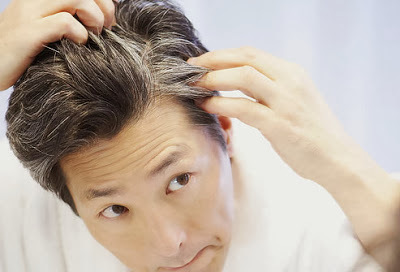 Deficiency of Vitamin A also cause premature graying of hair. Try to eat foods rich in Vitamin A. Dark green vegetables , yellow fruits and vegetables such as broccoli spinach, turnip greens, carrots, squash, sweet potatoes, pumpkin, cantaloupe, and apricots, and in animal sources such as liver, milk, butter, cheese, and whole eggs are good sources of Vitamin A.
Vitamin B12 deficiency also results in premature graying of hair.Liver, kidney, yogurt, cheese, eggs, dairy products, nonfat dry milk, fish, clams, oysters, salmon and sardines are good sources of Vitamin B12. Deficiency of certain minerals and ions(Iron, copper , zinc, Iodine) also cause premature graying of hair. Beef, dried apricots, red meat, parsley, eggs, wheat & sunflower seeds are good sources of iron. Almonds, cashews, crabs and oysters, egg yolk & whole grains are good sources of copper.Red meat, chicken & green vegetables are excellent sources of zinc.Banana, carrots and fish are best sources of Iodine. (i)Avoid excessive intake of Iodine because heavy intake of iodine adversely affect thyroid gland and may cause premature greying of hair. (ii)Avoid excessive intake of tea and coffee. (iii)Avoid excessive exposure to the UV Sun rays. (v)After bath avoid very hot hair dryer because it can damage your hair and may result in further premature graying of hair.